Sailing courses in a fun, friendly and safe environment! Competent Crew, Day Skipper, Coastal Skipper, Yachtmaster and Cruising Instructor. For those of you who may not wish to complete an RYA course but just wish to go sailing or hone specific skills. Please take a look at our other courses and ideas. RYA Shorebased Theory courses as well as online or 1 day SRC (VHF) course. At Sail the Canaries we aim to deliver the best quality tuition in a fun, friendly and safe environment. Our sailing courses are run on a friendly yet professional basis with experienced instructors who will make your sailing lessons both fun and memorable. We are based in Corralejo in the north of Fuerteventura. Our cruising grounds are between the numerous ports and anchorages on Fuerteventura and Lanzarote. It has ideal sailing conditions with good steady winds, lots of places to visit that are close by as well as all year round sunshine! Fuerteventura is famous for it’s great winds and incredible beaches. It is Europe’s home of wind and kite surfing and has a lovely laid back and friendly feel to it. Sail The Canaries is a recognised Royal Yachting Association (RYA) Training Centre. 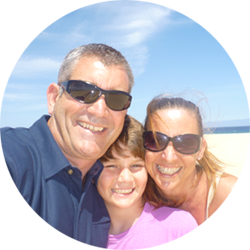 Sail the Canaries is a small, family business run by Clive & Alex Moreham and together with our young son Ben, we run our school out of Corralejo in Fuerteventura.